Complimentary Income Mapping and Social Security Maximization Strategies. Suddenly it seems like everything is a headwind. The Federal Reserve is raising rates. Cost pressures are percolating. Valuations are under siege and a decade-long bull market is at stake. Rather than provide comfort, earnings have become a source of anxiety, with next year’s estimates falling for the first time this year. In real life, the present determines the future. In the stock market, it’s the other way around. Investors are looking weeks and months ahead, and finding nothing to get excited about. 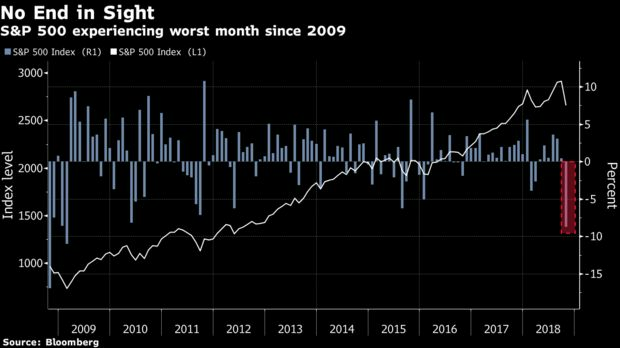 As a result, the S&P 500 is on its way to the worst month since 2009 and everyone’s in a state of disbelief. It used to be that however glum stock traders got, earnings season would arrive and cheer them up. That it hasn’t happened this time around is a big source of the current anxiety. The numbers have been indisputably great — profits will rise by more than 20 percent for a third straight quarter. But an outsize focus on higher input costs and tariffs is stealing the spotlight. 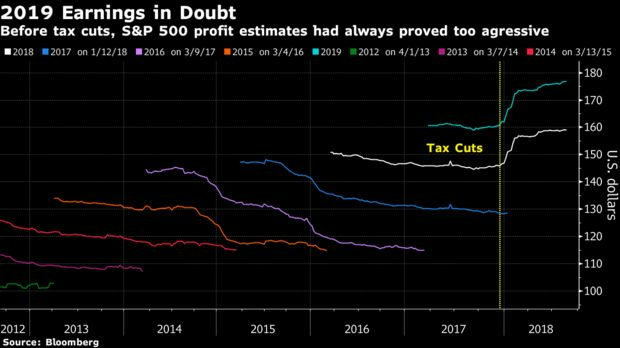 Worse, analysts are taking the knife to next year’s S&P 500 forecasts. They’ve gone from $177 a share a month ago to $176.60 now — not a lot, but the wrong direction. It isn’t helping that famous prognosticators say there’s more cuts to come. Citigroup’s Tobias Levkovich says next year’s projected growth rate of 11 percent is a reflection of the very euphoria that set the market up for its current shellacking. Roughly half that rate of increase is the more likely outcome, his models show. 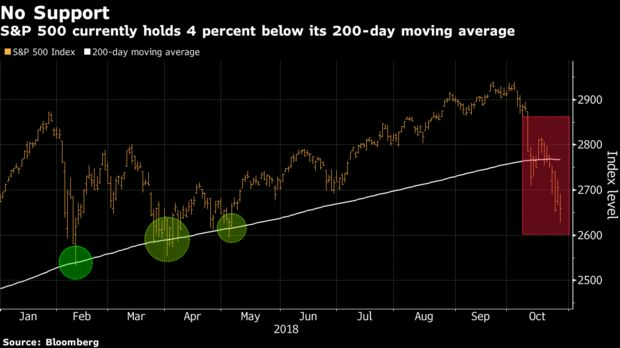 Even grimmer is Evercore ISI’s Dennis Debusschere, who lowered his 2019 target to $170 a share and said if historical valuations prevail, the S&P 500 may not bottom till 2,550. That’s 4.1 percent below Friday’s close. Another thing sapping faith in the future is how persistent the losses are now. Three trading days left in October and the S&P 500 has only closed higher five times in the month. Losses are coming at more than twice the frequency of the last three corrections, messing with investor psychology and introducing worries that maybe this time is different. Before, you could believe that technical levels such as the 200-day moving average would show up and lend support, as it has in three episodes prior this year. Now the gauge is nowhere close to that level — almost four percent below it. In the economy, things are so good that people are wondering if they can get much better. Next week’s jobs report is expected to show the unemployment rate in October dropped to the lowest since the late 1960s. Consumer comfort is hovering near all-time highs and the U.S. economy grew 3.5 percent in the third quarter as spending jumped. If there’s no room for improvement, what’s left to get investors excited? In the absence of future catalysts, bulls are left simply to announce that everyone who is selling stocks is wrong. Investors need to come to their senses, according to Peter Jankovskis, co-chief investment officer at Oakbrook Investments. Trade has been an issue all year, the Fed has telegraphed that it’s raising interest rates for some time now, and the economic data has been strong. But wait, is it really true there’s nowhere to go but down? The concept of “peak earnings” has been talked about for months, ever since Caterpillar Inc. said it might have seen a high-water mark of expansion. But peak earnings really means “peak earnings growth,” according to Dan Suzuki, a portfolio strategist at Richard Bernstein Advisors. Profits are still going up, just not as fast. Since 1980, earnings growth has peaked 11 times, according to Suzuki, and in the years following 10 of those periods, S&P 500 returns were positive, with an average gain of 18 percent. And it’s not like the list of future catalysts is completely empty. Maybe the end of the midterm elections will usher in more certainty or calm. A trade deal between the U.S. and China could still be reached. And the Fed could slow its path, although that may take a much more negative reaction that the one we’ve currently seen in stocks. Still, those are all ifs.